Axis Lighting has introduced several new products to its extensive line. MikroLite™ 1.0 – MikroLite™ 1.0 is a high-CRI, glare-free linear downlight module ideal for accent lighting applications. It is compatible with Stencil Pendant, Stencil Pendant D/I and Stencil Surface. The highly esthetic 1” square-in-square beveled TIR optical system provides superior visual comfort with flawless color mixing and streak-free vertical surfaces. MikroLite™ 1.0 modules include four cells and offer a choice of beam spreads, a black or grey finish and four color temperature options. MikroLite™ 1.5 – MikroLite™ 1.5 is the first high-performance, high-CRI, glare-free, color-tunable miniature linear downlight in its category. The highly esthetic 1.5” square-in-square optical system delivers superior visual comfort, flawless color mixing and streak-free vertical surfaces. Boasting an efficacy of up to 111 lm/W with a black finish, and an output of up to 1100 lm/ft, this linear downlight is suited to general lighting and high-ceiling applications. MikroLite™ 1.5 is compatible with all mountings of Sculpt, Beam 2 and Beam 4, and is available as a stand-alone Recessed Downlight in square and linear forms. For more on Axis MikroLite™ and design applications, download the Axis Design Brochure here. Edge 2 – Axis’ Fall 2018 launch features Edge 2, an innovative linear ambient lighting tool with a two-sided lens that allows you to frame, trace and outline any indoor space or element with original lighting configurations. Edge 2 lets you create signature lighting designs using vertical, horizontal and corner mounts in both surface and pendant options. Axis Edge: Click to download the brochure. Sculpt Geometrix (recessed) – Break free of the traditional 2×2 and 2×4 grid. Create new, integrated lighting and ceiling designs using triangles, parallelograms and trapezoids. Discover new and exciting opportunities above and beyond the norm for architectural ceilings, brought to you by industry leaders Axis Lighting and Armstrong Ceiling Solutions. Stencil Pendant Direct/Indirect – Introducing Stencil, an ultra-thin LED pendant lighting system that gives you more design freedom and more lighting power than any other miniature luminaire. Inspired by the Bauhaus movement, Stencil is simple, functional, repeatable, scalable and affordable. It provides linear and non-linear lighting tools based on a palette of LiteForms that can be joined and repeated to create exciting patterns for architectural spaces. 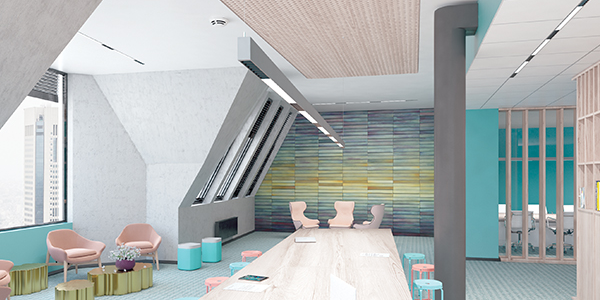 Stencil Surface – Stencil Surface brings a new level of creativity and flexibility to surface lighting while addressing the many challenges of surface installation through a patent-pending attachment system. The result is a fully integrated, minimalist and adaptive lighting system that embraces the grid and gives the space center stage. Axis Stencil Linear: Click to download the brochure. Axis Stencil Surface: Click to download the brochure. Zen Family – The Zen family of architectural, compact inverted-U downlights feature compact profiles, an integral mini-driver and a choice of shielding options. Using SurroundLite™, the Zen family delivers visual comfortable lighting throughout the space. The family has now been expanded to include the new Zen Square pendant and wall mount as well as the Zen Surface and Zen Beam Recessed. Axis Zen: Click to download the brochure. Click Family – As plenum depth shrinks, shallow luminaires like Click are increasingly in demand. With ultra-thin Click, you no longer have to worry about AC ducts and other obstructions in the plenum space. You also benefit from a patent-pending hassle-free installation system. The product of an exclusive Axis-Armstrong® innovation partnership, Click is the first true install-from-below shallow luminaire, compatible with Armstrong on-center ceiling systems. Axis Click: Click to download the brochure. SurroundLite™ – Axis’s SurroundLite collection of architectural lighting innovations represents a new way to think about light and lighting. With a 3D light distribution that emits as much light from the ends as from the sides, SurroundLite provides wide spacing, exceptional uniformity and reduced cave effect, resulting in fewer luminaires needed to light a space. All SurroundLite luminaires have an integral control-ready driver and feature a simple optical, electrical and mechanical connection system, facilitating installation and maintenance. Axis SurroundLite™: Click to download the brochure. For information on applying Axis products to your project, contact us here at ERW.